传记: Steve Wang was born in China and grew up in Taiwan. There, he earned a bachelor's degree in architectural design. Later, a national honor scholarship sent him to the United States for graduate study, where he majored in product design at the Illinois Institute of Technology in 1966. 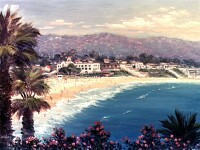 Steve and his family moved to southern California in 1977. His two childern grew up in Orange County. The family has been living happily there, ever since then. Steve is a proud contributor toward the growth of southern California through his work in architectural rendering. In the Meantime, he has been cultivating his passion for painting. 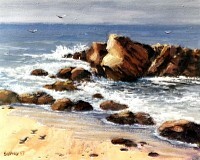 Being an award winning artist, his plein air oil paintings and multi-media contemporary paintings have been exhibited and collected in the States and overseas. 描述: You-Sui (Steve) Wang was born in China and grew up in Taiwan. After earning his bachelor's degree in architecture, he completed graduate work in industrial design at the Illinois Institute of Technology in Chicago. Encouraged by his father, a traditional brush painter, Steve's interest in art sprouted very early in his childhood. During his school years, he was frequently the class representative and winner of many art contests. 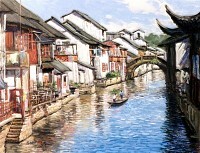 While studying at Cheng Kung University, he was the top student in Master Painter Kuo Bo Chuan's class. During his four years spent teaching in the architectural department of Tunghai University, he developed a keen friendship with pioneers of the Chinese Contemporary Art Movement. Thus in 1971, Steve's paintings could be seen in exhibitions alongside the works of Chuang Che, Chen Ting Shi, and Liu Guo Song at the Devon Art Gallery and the OshKosh Art Museum of Wisconsin. In 1990, he participated in the Nagoya International Design Show. In the following years, he persisted in refining his artistic ideas by participating in various local exhibitions. His paintings were selected for honorable mention at the Huntington Beach Art Show, San Diego Art Institute's 43rd Annual International show and several regional shows.